One of the Masters of the “Red” Camp. However, he chose to act independently with his Servant without joining Shirou Kotomine’s group. His Servant is Saber of “Red,” Mordred. His fiendish appearance is just like that of an American outlaw. He isn’t a magus, but rather a magecraft user. Though he can’t match magi in terms of knowledge, he ranks equally in terms of battle experience with Darnic who has survived for a hundred years. He normally wanders from battlefield to battlefield recovering the corpses of magi and plundering their Magic Crests. Fundamentally, he intentionally acts so as not to increase the number of casualties. This is because causalities are always appearing somewhere in the world every day and night even without him doing anything. He habitually uses a sawed-off (meaning with a shortened barrel) shotgun as a Mystic Code, but he only uses it as medium for the Gandr spell and doesn’t use it in its original purpose as a gun. Also, he fundamentally uses things like hand grenades made out of hearts, animal eyeballs and monkey hands as part of his necromancy, so the majority of his Mystic Codes are in extreme bad taste. He chose to participate in the Great Holy Grail War after receiving a request from the Mage’s Association. Originally, he had planned to fight alongside the other “Red” Servants, but he chose to take independent action due to not being able to trust Shirou Kotomine and his Servant Semiramis. He and Saber engaged in skirmishes with the “Black” Servants and won against Berserker of “Black,” but then they noticed the scheme of the “Red” Master Shirou Kotomine and decided to put the war on hold. However, they still fought to obtain the Holy Grail right till the very end, but they dropped out of the Great Holy Grail War when Mordred and Semiramis dealt mutually fatal strikes against each other. The actions that Shishigou took to save Mordred also backfired on him and caused him to die. The sole thing decided about the two of them from the initial plotting stages was that they would “rampage around as they like without regretting anything and fight and fight until they die while smiling” as “this story’s Bonnie and Clyde.” Well, Bonnie and Clyde didn’t die while smiling, though. In the past, Shishigou’s talent as a magus was first-rate, but is now second-rate. As a magecraft user, he is first-rate. As a Master, well, I suppose he gets a passing mark for having well managed Mo-san, who is quite tricky and difficult to deal with, without once antagonizing her. 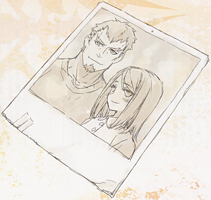 He seems to have poured a lot of affection towards his stepdaughter whose name was never revealed in the story, and if you search the back pockets of his jacket, you can fight an old photo of the two of them together there. However, his appearance became fiendish after he began going out to battlefields, so his face in the photo is very much that of a serious scholar. If Mordred ever saw that photo, she would first laugh for a while, but then she would understand the unpleasant truth about it and turn silent. In other words, she would realize his unbelievable despair of having chosen a wound-filled life that made the man into that photo turn into the person in front of her. The wish that Shishigou had for the Holy Grail was actually something truly acute. Somewhere in his heart, he thought that the wish that he publicly spoke of wasn’t true, but that his real wish was simply to undo the death of his stepdaughter. The moment he realized and accepted that, everything about Shishigou’s life as a magus reached its end. Furthermore, in the initial plot, Shishigou Kairi was descended from the family that Darnic chased out. However, it created a contradiction chronologically and the plot wasn’t that entwined with Yggdmillennia in the first place, so it was easily discarded.